Cheerleading teams from around the nation gathered yesterday to compete in the Fifth Aloha International Spirit Championships at the Waikiki Shell. Among them were the California Flyers of Santa Clarita, Calif. The finals are tonight. 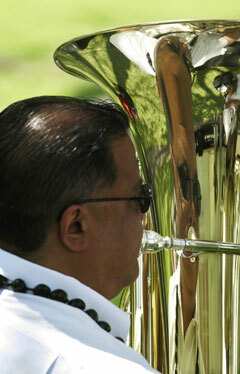 Daniel Asao was reflected yesterday in his tuba, which he plays in the Royal Hawaiian Band at the group's weekly noontime concerts at Iolani Palace. 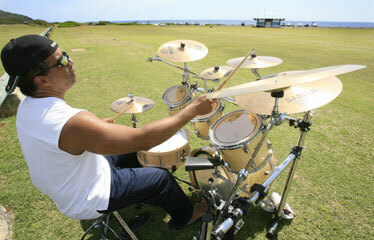 Hawaii Kai resident Kalono Kaumakapili found some rehearsal time in the company of blue skies and cobalt seas yesterday morning as he practiced on his drumset at Sandy Beach Park. Kaumakapili drums for the Country Living Band as well as New Hope Hawaii Kai and cites Akira Jimbo, Steve Gadd and Dennis Chambers as influences.